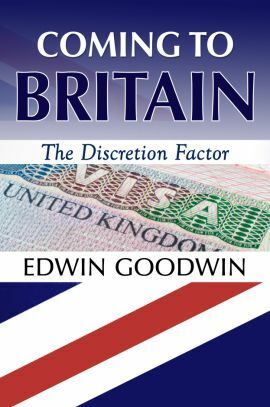 LONDON - March 14, 2018 - PRLog -- Author Edwin Goodwin attempts to appraise the UK's immigration system in his new book, 'Coming to Britain: The Discretion Factor.' As an immigrant from Nigeria who has been lawfully living, studying and working in the UK since 2005, Goodwin has personal experience in what he believes are the controversial discretionary policies of Britain's immigration gatekeepers, the Home Office. Using the same bold and well-researched approach as he did in his 2017 book, 'Appraisal Science: Appraising Healthcare Professionals,' Goodwin unpacks the policies, arbitrary changes and discretionary interpretations that negatively impact the UK's immigrant population. While Britain hangs in Brexit limbo, EU nationals, asylum seekers and other unsettled migrants are stuck in their own torturous limbo, created—perhaps by design—by a government agency that lacks proper managerial oversight and instead embraces discretionary enforcement of immigration policies that often seem to undermine the basics of compassion and human rights in favor of misguided caps on migration. Goodwin examines many layers of this issue, including legal precedents, the UK's Human Rights Act, the abuse of discretion and the manner in which the Home Office implements their blurry policies. In addition, Goodwin exposes the suffering that these policies impose on immigrants. While some are forced to live in sub-par conditions in detention centers (with no release in sight), others try to carry on with their lives in a constant state of fear of deportation. In some cases, as Goodwin explains, the psychological stress of detention and risk of deportation lead to desperate measures and threats of suicide, which further complicate how the policies are interpreted and applied. The frustration with a broken system is palpable in 'Coming to Britain.' Goodwin doesn't mince his words, and he uses his own experience and solid research to empower and inform others. "As a law-abiding immigrant, I have received fresh scars from the UK immigration system," says Goodwin, "and I feel that discussing them is in the best interest of the majority that may be concerned, even if it necessarily reflects critically on the bureaucratic giant best known as the Home Office." Review copies of 'Coming to Britain: The Discretion Factor' are available to media contacts upon request. Edwin Goodwin is available for interviews. Edwin Goodwin migrated to the UK from Nigeria as a student and to join his family in October of 2005. He completed his undergraduate studies in 2008 at England's University of Wolverhampton where he also achieved a Postgraduate Certificate in Biomedical Science in 2010. While working as a biomedical scientist for the National Health Service, Goodwin was awarded a Certificate of Academic Development in Medical Microbiology and Clinical Bacteriology in 2010 by Liverpool John Moores University. Goodwin lives in London (UK) and currently works in the field of Facilities Management. In July 2017, he was appointed as Mentoring Programme Manager at Speakers of Croydon (part of Toastmasters International, a global organisation devoted to communication and leadership skills development). He invests his time in creative writing, strategic personal development and mentoring young people, and was awarded a Certificate in Volunteering by the Mayor of London in March 2015. In March 2017 Goodwin published a book entitled 'Appraisal Science: Appraising Healthcare Professionals' in which he delivers a critical, thorough overview of the UK's appraisal system for healthcare professionals.